There is no greater honor than to serve the Kingdom of God. However, with this great honor, comes great responsibility. It’s no wonder many of us get stuck when it comes to ministry appreciation gift ideas. If you serve in ministry, then you know, many of us put in a lot of love hours. And when we’re in the trenches of serving, it’s easy to get caught up in the routine of it all. This doesn’t just go for those serving. Those who are being served, can overlook acknowledging those who serve. Like with any job or relationship, people want to know that they are appreciated and are doing a good job. And this can be done easily by purposing to encourage each other. We are told in 1 Thessalonians 5:11 to encourage one another. However, encouraging one another doesn’t stop at those coming to church to hear the word, or even the Pastor. No. Encouraging one another includes those who serve the Body of Christ as well. Although October is ministry appreciation month, we should develop a lifestyle of encouraging one another; especially those in ministry. Those who serve in ministry don’t necessarily have the time to serve; they have a heart to serve. And there are some simple ways we can show appreciation for utilizing their gift and serving the Body of Christ. The best thing you can do for those who serve in ministry, is to pray. Pray that they keep their zeal in serving, and for God to give them a supernatural measure of grace; to do all that He has called them to do. This might sound like a double standard when we’re talking about acknowledging those who serve. However, most volunteers get burnt out because they are stretched too thin, serving in areas others aren’t unwilling to serve. Our mentors instilled in us, that many hands make light work. When others raise their hand to serve, it alleviates the burden from others who are serving in multiple ministries. When everyone puts their hand to the plow, it paves the way for others to serve with a joyful heart. In our opinion, this is one of the most effective ways to show appreciation to those in ministry. By taking a few minutes to communicate your appreciation, it will do more for them than you can imagine. When we sow countless hours in ministry and begin to feel weary, then suddenly someone tells us that the message we preached blessed them; that strengthens and encourages us to keep going. When we send a love note, encouraging someone who God placed on our hearts, and they tell us we don’t know what that did for them; that helps us to continue following God. Encouragement goes a long way, and you can do this a number of ways. You can call them to give words of encouragement, give them a handwritten note, buy an encouraging card, or even send an eCard. So, don’t let postage, or time, stand in the way of encouraging others. God is unwilling to abandon a cheerful giver (2 Corinthians 9:7). If your heart is your giving, God will provide you with the resources you need. Providing a meal, whether delivering a meal that was ordered, or preparing a home cooked meal, is not only a blessing to their tummy, but a time saver! Many servants of the Lord, sow personal time that takes time away from their families. Something as simple as providing a meal, gives them a break from cooking, and gives them more time with their family. Often times those in ministry have children, and their time is stretched between family and work obligations. Not to mention, where they serve in church. The thought of finding time for a date night or time to their self is often overlooked due to finances or not having a babysitter. By offering to baby-sit for free, just to be a blessing, will allow them time to themselves or a date night. Trust us, that will bless them more than you know. Gift giving can be a challenge for some because they don’t know what to give, not sure what the recipient needs, or one may feel limited by funds and can’t afford won’t do much. Well, those may be facts, but the truth is, many servants volunteer their time, and they are not looking to receive money for it. However, those who serve not only volunteer their time, they also sow financially into their ministry. With that said, every now and then, it would be a nice gesture to sow a financially blessing to them for their work to the ministry. Coffee Gift Card: Those who serve are often operating with limited time and a nice cup of tea or coffee on the run is perfect. Grocery Gift Card: This is a great way to sow back into their personal needs since they sow personal time and resources into the ministry. Stationary With Their Name On It: Many Pastors, or Teachers in the ministry send notes to their people and congregation so this make a generic gift very personal. Gift Card To A Restaurant Or Movie: This allows them to take time for themselves, and / or with their spouse. Financial Gift: This is probably the most uncomfortable for most. Trust us, we get it. However, God has shown us that this is scriptural. And sometimes blessing those who preach and teach, is appropriate. For more ideas on ministry appreciation, check out free tools and tips in DaySpring’s #ReturnTheBlessing campaign. This page is filled with resources, including; free eCards, and creative ways to show your appreciation and more. For those who serve in ministry, we want to leave a word of encouragement. Whether someone acknowledges you or not, resist the temptation to grow weary in your serving. God is mindful of your service to Him. And He will not overlook what you have done for His kingdom. Yes, it would be nice to be acknowledged, or have others show appreciation for what you do in ministry. However, we serve unto the Lord and not unto man. Therefore, your service to Lord is valued. For many of us, we might not see our rewards until we get to Heaven. And to receive your reward in Heaven, is far greater than any gift here on earth! Do you have another ministry appreciation gift idea? If so, comment below. We make gift giving to our volunteers a priority in our church, and we are always looking for creative gift giving ideas. 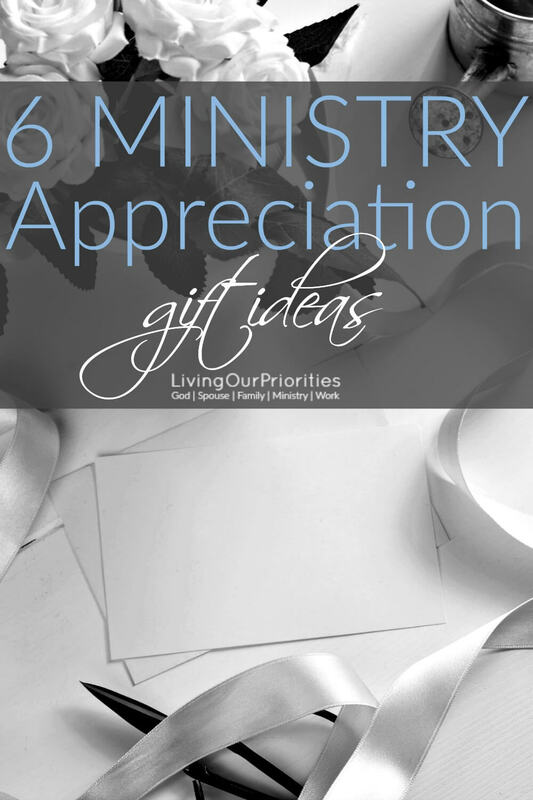 Thank you so much for sharing these great ideas for ministry appreciation! I think #1 is more important than we know, and look forward to blessing those in ministry around me with some of these ideas.